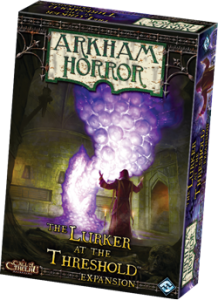 This post reviews “The Lurker at the Threshold”, an expansion for Arkham Horror, and not the full game. If you don’t know Arkham Horror, it’s an excellent horror game based on H P Lovecraft’s 1920’s setting where the players travel around the town of Arkham (and often into weird dimensions too), having unusual encounters as they work together to stop the Great Old One awaking from its slumber (which will likely spell doom for mankind). During the game, players try to increase their abilities to keep the menacing goings-on in check and their bodies and their sanity intact. 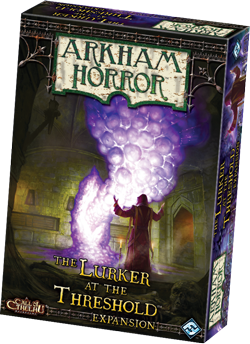 Lurker in the Threshold is a small expansion so consists of new cards, tokens and game mechanics and no new board. We played with just the basic game and the Lurker expansion. I always like to play new expansions on their own with the basic game the first time so it’s possible to really see what they’re like. Dark Pacts with the Lurker – One of the three new game mechanics in this expansion is ‘The Lurker’ itself who is a Herald. Heralds are powerful supernatural entities preparing the way for the Great Old One – they are monster characters who affect the gameplay and makes things harder for the players while the Great Old One slumbers.